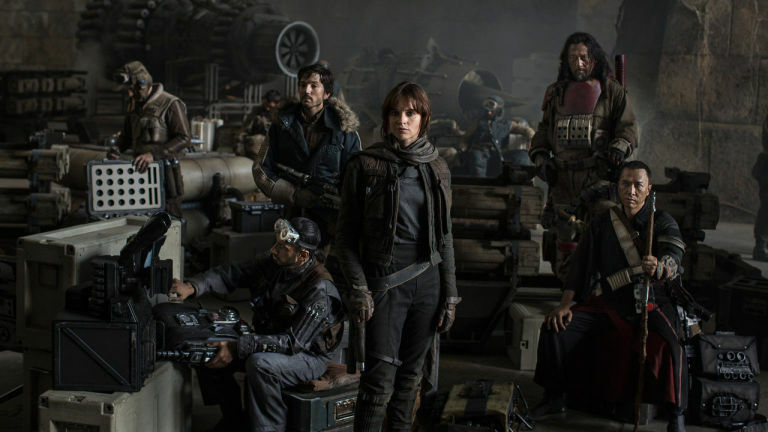 The Rogue One cast guest star on Lucasfilm's 'The Star Wars Show'. Andi Gutierez sat down with the stars of Rogue One in a special episode of Lucasfilm's hit online show. The Rebels Recon presenter spoke with Diego Luna, Felicity Jones, Donnie Yen, Mads Mikkelsen, Riz Ahmed, Alan Tudyk, Ben Mendelsohn and Gareth Edwards. The show also disclosed unseen footage from the Lucasfilm staff party. During the party, a phone call interrupted the speech of Lucasfilm President Kathleen Kennedy. The man on the phone said he spoke to George Lucas, director and creator of the original Star Wars, for over thirty minutes and said Lucas was extremely happy with the film. Rogue One is set to hit movie theatres in a week's time, making it's debut in the UK and the Netherlands on December 15 and North America on December 16.